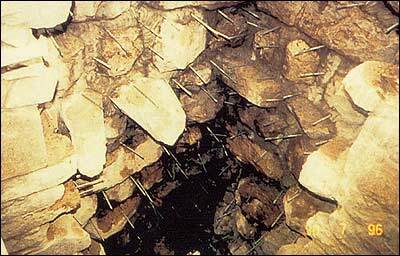 The beginning was in the upper four rows of the stones below the roof where the adhesive material was removed from the sections in between the main rocks, while keeping the outer part of the stones as it was. The stones of the wall and the internal stones were given numbers, cleaned and washed so that they might be restored to their previous sites later. The gaps between the stones were covered with very strong adhesive material. Then the stones of the wall and the interior front were replaced in their original locations. The vacuums were filled with a stable cement mixture. Reinforced steel rods were also inserted, before the cement, to connect the stones from the exterior to those of the interior. As a result the top four rows of upper stones became structurally sound. It was a difficult procedure since work was vertical rather than horizontal. An interior front of the wall of the Holy Ka'bah. Demonstrationg the stage of the repair. The stones were numbered and removed so they could be returned to their exact positions. The resulting spaces were propped up with wooden supports laid horizontally and at regular intervals. 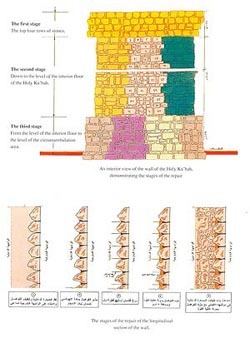 It was decided that the treatment of the exposed areas should be in sections starting from below the top four layers, followed by another layer to the bottom of it, and .so on to the level of the interior floor of the Holy Ka'bah. Starting at the upper areas, the fronts of the stones were cleaned. The stones were also cleaned with fresh water, and dried with blowers. The exposed sections were then refilled by special high-speed machinery with a special mortar. After that material had hardened, a second and extraordinarily durable mixture was used to replace and cement the face of the wall. Reinforced metal bars were also placed inside of the wall. These bars were then fastened with a specially formulated mixture. These rods strengthen the cohesion and adhesion between the outer parts and inner parts of the wall or between the lining and the inner face. In rebuilding the interior facc, the work progressed from the bottom to the top, where every stone was cleaned and laid in its proper place according to its numbering. This was done after filling the gaps with a strong mortar. Everything was sprayed with a long-term insecticide to eradicate all microscopic organisms and insects. Sections were filled in and resistance-treated materials were laid in a horizontal and vertical network in order to strengthen the connection between the inner and outer walls and achieve a unity of form. As in a carpet, this formed the woof and the warp of the Holy Ka'bah. The same procedure was then repeated in all the remaining vertical sections. 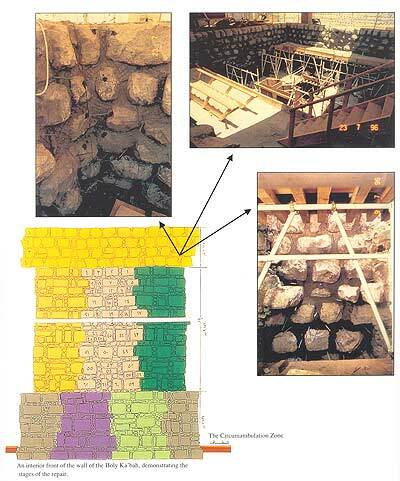 The second stage ended by completely filling in the remaining gaps between the stones with high strength mortar that would not decay or loosen. 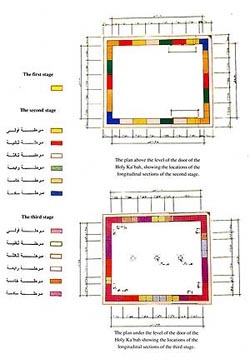 The stages of the repair of the longitudinal section of the wall The plan under the level of the door of the Holy Ka'bah showing the locations of the longitudinal sections of the third stage. 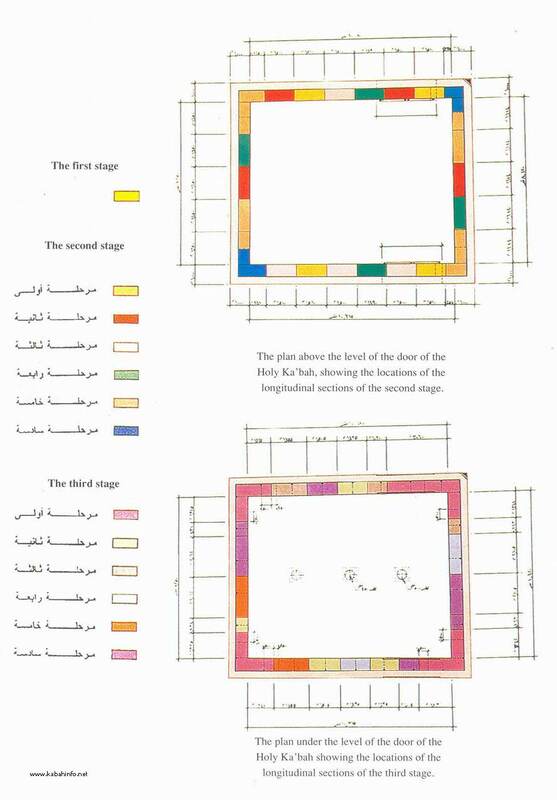 This stage comprised the excavation of the floor of the Holy Ka'bah from its present level to the depth of the level of the circumambulation zone, 2.2 metres. Digging up the floor of the Holy Ka'bah was not an issue that could be decided on hastily. On the other hand, the complete renovation of the wall of the Holy Ka'bah might not be implemented without the inspection of the foundation. The first step was to determine the extent of digging needed for the excavation. Accordingly, one side of the Shami Corner was selected as an exploratory pit that went down to the level of the circumambulation zone. It was just wide enough to determine the state of the wall and some of the foundation stones. 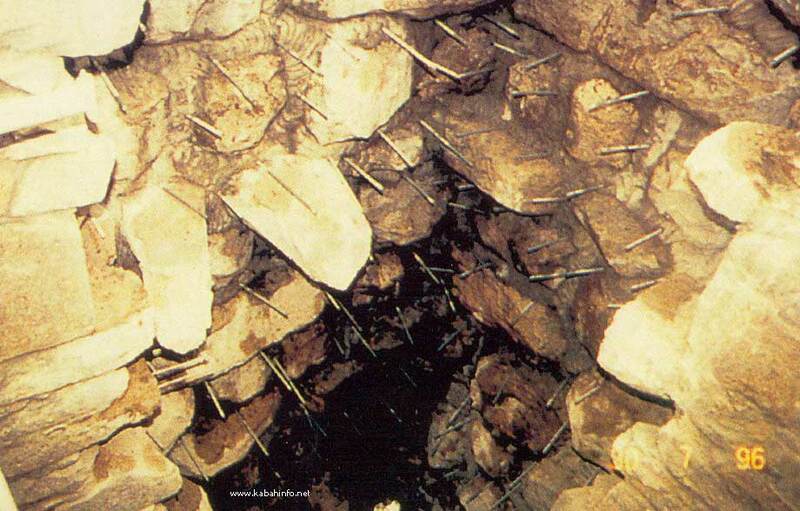 After the excavation and examination, it was discovered that the condition of the bases was much better than that of the upper walls of the Holy Ka'bah. Also, some possible future problems were noted, so it was decided that excavation and renovation were vital. 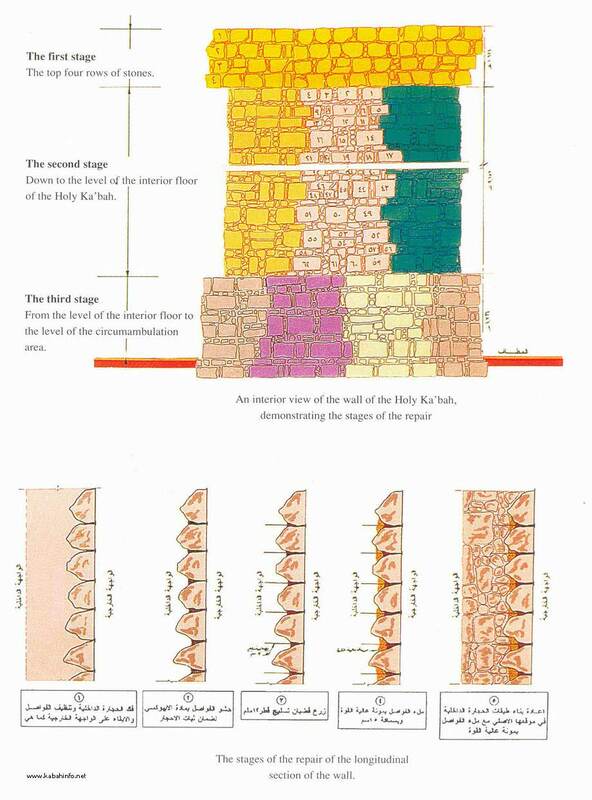 The complete excavation and renovation of the floor of the Holy Ka'bah was the same as the renovation of the upper wall. The floor was divided into vertical sections and the work was symmetrical like that of the upper walls. The work was to the level of circumambulation, ranging from between 1/2 to 3/4 of a metre. This was the distance to the strong, compact, foundation stones that were not in need of rebuilding.